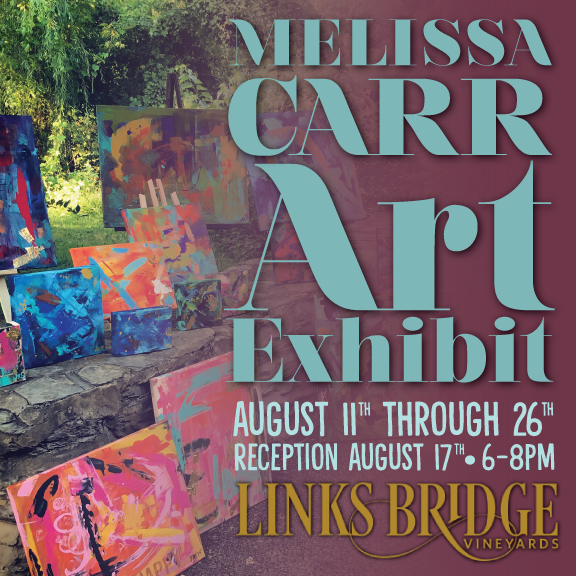 From August 11 through August 26, we will host a colorful selection of abstract paintings by Frederick County artist Melissa Carr. Melissa specializes in illustration, graphic design, and painting. She earned a degree in graphic design at the Art Institute of Pittsburg and is working on a Masters in Education at Mount St. Mary’s University. This is leading to a fourth specialization–encouraging the creativity of children and introducing them to the world of art. We hope you’ll come on by for a look at Melissa’s paintings and enjoy a glass of wine at the same time! You’re also invited to meet Melissa at a reception on Friday evening August 17th, 6-8pm.